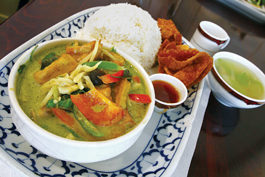 THE GAENG'S ALL HERE: Krungthai's gaeng kiew waan with tofu is a green curry delight. DEAR THAI FOOD, I'm sorry. I've been away a long time and haven't paid you any attention. I've been pretty rude, I know. Maybe you didn't even notice, now that you're so popular, but please hear me out before you tear up this letter. When we first met more than 20 years ago, it was love at first bite. I'd never experienced anything quite like you before. The electric flavors of your salads had me tilting plates into my mouth to savor every drop of fish sauce and lime juice. The racy heat of your curries drove me mad. The savory sour-sweetness of your coconut milk soups made me crazy with food lust. I couldn't get enough of you. But, to be honest, in time I got bored and I moved on. Your novelty wore off. I started to spend time with other foods. I even started to hang around with my first love again—Mexican food. It went on like this for years. When others spoke of your virtues, I dismissed you with a cold shrug. Thoughts of pad thai, red chicken curry over rice and green papaya salad failed to stir the passions they once did. But then something happened. I went to Krungthai in San Jose and I remembered what attracted me to you so long ago. Krungthai is a perennial Metro "Best Of" winner. It's been open since 1988, but tastes fresh and new to me. Like most Thai restaurants in Silicon Valley, it focuses on the food of central Thailand but includes a number of fiery southern-style dishes as well as a several nods to China's influence in the country. I think it was the restaurant's fearless use of chile pepper heat that attracted me back to you. You want it spicy? You get it spicy. Too many Thai restaurants tone down their food to appeal to the masses. At Krungthai, medium spicy was more than enough to make me sweat. To see what I mean, try the pad see ew ($7.59), wide rice noodles pan-fried with a choice of chicken or beef, broccoli and egg in a light but smoldering sauce. The restaurant also serves solid versions of classics. The pad thai ($8.59) is refreshingly spare and light on the use of peanut sauce. Too much can gum it up. Tom kha gai ($6.59 for small bowl), that sour-sweet and creamy coconut-milk-based soup of chicken, mushrooms and galangal, is as good as I remember. But it was Krungthai's deep and diverse menu of lesser-known dishes that really restored my affection for Thai food. The pungent and pleasingly spicy eggplant salad ($9.59) made with roasted eggplant, shrimp and ground shrimp let me know I'd been away too long. And then there was the gum poo prik pao ($15.59), as fun to eat as it is to say. Eating crab in the shell at a Thai restaurant is commitment. You're gonna get messy. But this dish utilizes just the crab claws, and the meat dangles out of the end, ready for you to pluck it. It feels like cheating. Tossed with a spicy sweet chile and onion glaze, it's spot-on. I had a feeling the beef garlic pepper ($7.59) was going to be good. For me, it is dishes with the simplest explanations that are often the best. In this case it's described as just "deep fried beef with garlic pepper." If garlic were an illegal substance, possession of this dish would get you 20 years in prison. The thin slices of tender beef are coated in nutty, sweet, fried garlic slices that get a lift from black pepper. It's an addictive, candylike dish that I was still thinking about (and tasting) the next day. Krungthai's soups go beyond the same old coconut milk regulars, with outstanding specimens like kang sop ($7.59 for a medium bowl)—Napa cabbage, shrimp, cauliflower and tamarind sauce in chile-pepper-enlivened broth. For dessert, I skipped the mango with sticky rice and went for the tab tim grob ($2.50), chewy water chestnuts and jackfruit in coconut milk and crushed ice. The refreshing dessert helped douse the flames in my mouth and slowly turned pink as I stirred it around. What a sweet end to a meal. I thank Krungthai for showing me your charms once again, Thai food. I won't walk out on you again. Will you take me back?